On March 23rd, President Trump signed into law a 2,232-page, $1.3 trillion spending bill for 2018 that delivered the largest increase in federal research funding in a decade. Below are some of the highlights of the increases at federal funding agencies that are of interest to many of you. The NIH received a $3 billion or 8.8% boost to $37 billion. Of note is that the bill includes $414 million in additional funding for Alzheimer’s disease research and $500 million in new funds for the HEAL (Helping to End Addiction Long-term) Initiative, a trans-agency effort announced this week that seeks to speed scientific solutions to stem the national opioid public health crisis. The BRAIN Initiative received an increase of $140 million and the All of Us precision medicine study benefited from a $60 million increase. The NSF received a $295 million or 4% increase to $7.8 billion. Within that agency total, research and related activities got a $300 million increase to $6.33 billion, and education and human resources increased by $29 million to $902 million. The USDA’s Agricultural and Food Research Initiative that funds competitive grant programs for universities and other institutions received a $25 million or 6.7% increase to $400 million. The Department of Energy’s Office of Science benefited from an $868 million or 15% increase to $6.26 billion, and NASA’s science programs received a $457 million or 7.9% increase to $6.2 billion. The National Endowment for the Arts and the National Endowment for the Humanities each received a $3 million or 2% increase to $152.8 million. Overall, the $176.8 billion in research funding, which is an increase of $20.8 billion or 12.8% above 2017, came as very good news for many federal agencies. We look forward to having the opportunity through our seminars and workshops to help you and your colleagues compete successfully for grant funding. If you’ve never attended one of our seminars and/or are considering sponsoring one, please see the Feedback slider on our home page or click here to view comments from recent participants. 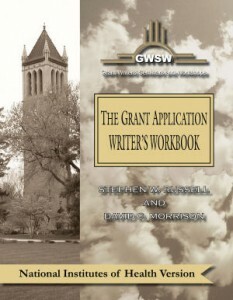 Our Workbooks are guides to successful grantsmanship that can make the difference in meriting funding. Indeed, many of our clients regard theirs as the ultimate authority on proposal writing. That level of regard derives from the practical, step-by-step approach that is offered. As a reminder, we recently updated the NIH Version and the NSF Version of The Grant Application Writer’s Workbook. The NIH Version complies with the FORMS-E instructions now required by the NIH for all applications due on or after January 25, 2018. We’ve also included new examples of well-written Specific Aims, Significance and Innovation subsections of the Research Strategy, Project/Summary, and Project Narrative sections. The NSF Version now conforms to the revised version of the Proposal & Award Policies and Procedures Guide (PAPPG) (NSF 18-1) for all proposals due on or after January 29, 2018. For details on the principal changes in both of these Workbooks, please see the links below. Finally, we want to acknowledge your support of our emails and blogs. We were recently named a Constant Contact “All-Star” and are excited to share the recognition with you! This annual designation is something that only 10% of Constant Contact customers receive for their excellence in building better customer relationships. We anticipate having another great year in 2018!